Shah Rukh Khan is a charming man and has always been in limelight. But, his son AbRam is even a bigger star when it comes to having a following. People adore him as he is literally the cutest kid on the block. Shah Rukh Khan makes sure to take some time off from his busy schedule to spend quality time with his kids. 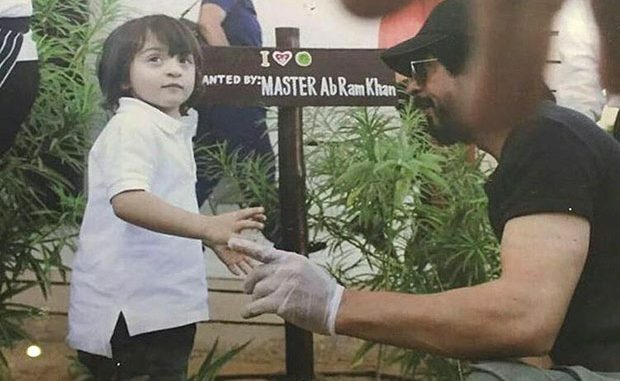 A photo surfaced online recently where SRK was helping AbRam plant a tree. The board next to AbRam read, “Planted by Master AbRam Khan.” He looked adorable in a white shirt and black pants. On the work front, Shah Rukh Khan is gearing up for his next film Dear Zindagi alongside Alia Bhatt which is releasing on November 25, 2016.